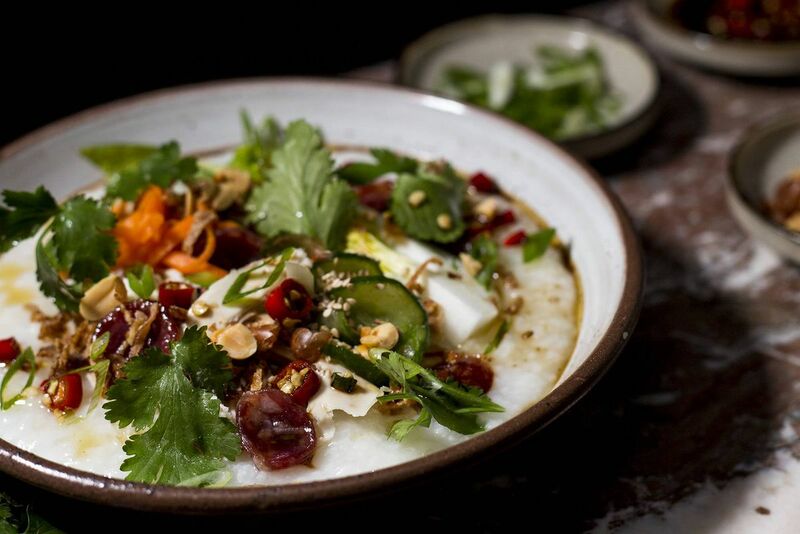 Prepare all the toppings in little dishes so each person can dress their individual bowl of jook as they see fit. Bring all ingredients to a simmer over high heat, but be careful not to let it boil. Reduce to medium-low and simmer for 25 minutes, skimming the surface to remove any scum that rises. Remove the chicken from the pot and allow to cool on a cutting board until it can be handled. Remove as much meat as possible from the bones and set aside before adding the bones and skin back to the broth pot to continue cooking. Simmer and skim for 40 minutes longer. Strain through a fine mesh sieve and discard the solids. Cool completely and store in the fridge until ready to use. Shred the chicken meat that was set aside earlier into bite-sized pieces. Store in the fridge until ready to use. Can be made up to two days in advance. Mix all together in a small bowl and allow to sit for 30 minutes to an hour to marinate before consuming. Store in the fridge until ready to use. Can be made ahead. Mix the cucumber slices and salt together in a small strainer and place over a small bowl. Allow the mixture to sit for 30 minutes. Squeeze gently to remove any excess liquid. Toss the cucumber with the toasted sesame oil and sesame seeds. Serve immediately. Mix the chilies and soy together. Can be served immediately.